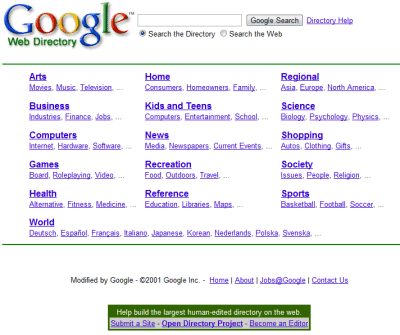 Google Directory was the second Google service launched, after the Web search engine. It was released in 2000 to compete with Yahoo Directory, the most popular Web directory at that time. Google used data from Netscape's Open Directory Project, but it added an innovative feature: automatically ranking results. Here's an excerpt from an article written by Danny Sullivan back in April 2000. "Google is applying link analysis in a new way, to the human powered information of the Open Directory. All I can say is hurray! I've been chanting for an end to the tyranny of the alphabet when it comes to directory listings for some time. Why should sites that begin with an A appear at the top of list, oppressing better quality sites that may simply begin with a letter further down in the alphabet? In many cases, this offers no help to the searcher." Directories were useful at that time because there weren't too many high-quality sites and reviewers could keep up with the growth of the Web. Now that the Web has a lot more than a trillion pages, it's impossible to maintain a directory, so algorithmic search engines are the only ones that can scale. 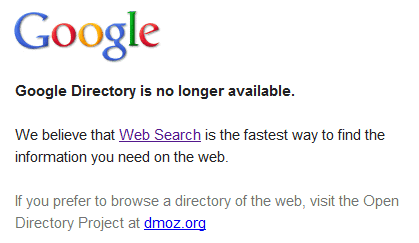 Now Google Directory is no longer available. "We believe that Web Search is the fastest way to find the information you need on the web," says Google. Google Directory has been irrelevant for many years and very few Google domains still included the service in the navigation bar. Last year, Google dropped the search feature and not many people noticed. this is the end of an era. or the beginning of a new one at google! Another silly move, Google. Not coping with the amount of information should not mean retreat. Search is not always a replacement for browsing. I have not searched the web with a subject catalog for ages. But I would love the option to restrict my Google search results to sites listed in the Mozilla directory. For some searches that would cut out a whole lot of search spam and still give useful results. There's nothing as good as human review to filter that junk out. There are a few well-maintained categories over at the ODP but most of them are so far behind. And the fact is, people rarely go to the ODP to browse. Look at Alexa's data for dmoz.org...you'll see that the largest component of traffic is from India. What does this mean? Excepting legitimate webpages oriented towards an Indian audience, this is a sure sign that the site is overrun mainly with spammers. I have been wondering for quite some time what is the use of directories and it seems the guys at Google have had similar thoughts. I think directories are seriously overrated, especially nowadays. Good move from Google, directories are relict of old era od internet - I am afraid, that only SEO "hunters" use them, but they have no regular users. Google+ is coming, Google has a good strategy to crash the competition and give all-in-one product! I miss Google Directory ... used it all the time. This is terrible, it was predicted by nostradamus, noooooooooooooooo.